Relate: “Turn this dirt into donuts.” For nearly six weeks Jesus had been fasting out in the wilderness. I’ve done long fasts. They say that after about three days the hunger goes away. This is true. We are addicted to eating and over those first few days are struggle is not so much true hunger as it is kicking the habit. Thing is, after about ten days to two weeks in, real hunger does start to kick in. The problem is no longer psychosomatic but rather your body is now telling you, “feed me or I’m gonna start dying.” The early hunger is in your mind but this hunger… it is real. Jesus was feeling it for a while when the devil showed up telling him to turn these stones into stickybuns. 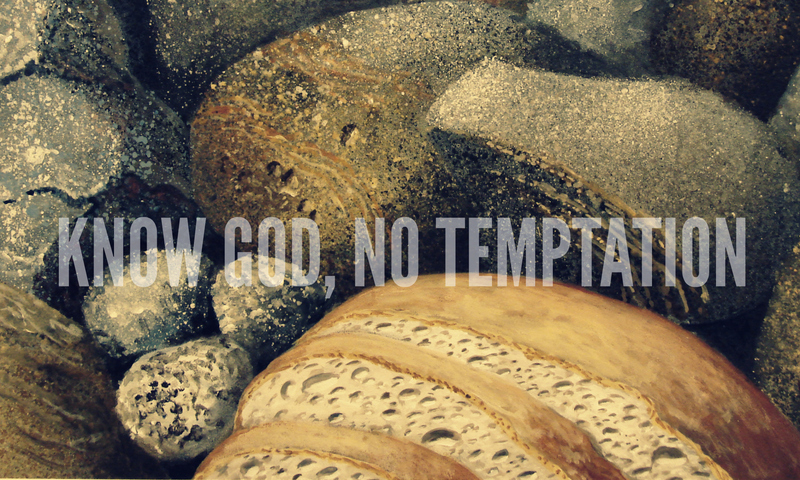 React: John the beloved wrote of these three types of temptation. He calls them the lust of the flesh, the lust of the eyes, and the pride of life. (1 J 2:16). Just a few verses before this he tells us how we can stand against this temptation. He calls his readers children, fathers, and young men. As Christians all of us fit into each category. We are children because we have a heavenly father. We are parents because it is our responsibility to reproduce our faith in the lives of those who come after us. We are young ones because we have a spiritual birth more recent than our natural birth. It is as children we know the Father. It is as spiritual parents we know the Son, the One who was from the beginning. (J 1:1-2,14) It is as those born again that we can know the Spirit who now dwells in us. (Romans 8:11) It is through knowing God that we can overcome the evil one. In fact, the more we know of Him, the less pull temptation will have in our life. So the question is, how well do I know God? I want to know You more. I want to learn of Your ways. I want to understand Your works. But most of all I want You. More than that, I want to want You more. Give me a greater, stronger, deeper passion for Your presence. You are the only thing that lasts. Everything else will fade away like the morning mist, but You… You are what’s real. We have all sinned. Yet He was tempted without sin. May we be like Him in His strength. Yes Lord. More of you in my heart.